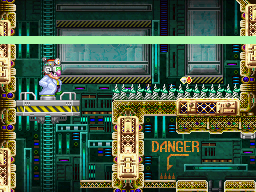 Carpaccio's Lab is the ninth level in Wario: Master of Disguise. It is Carpaccio's main base of operations and the home of the fourth Wishstone fragment. It is very high-tech with a lot of robots patrolling the area. It's main gimmick involves the power generators, which supply electricity to the various devices inside the lab. They are deactivated by default due to Count Cannoli shutting off the power to them, but they can be charged up by using Sparky Wario. There are two sets of four generators; one set supplies yellow electricity and the other supplies blue electricity, each color powering different devices. Whenever Wario presses a button in the lab, some of the power gets drained from the generators. Each generator can be charged up to power two button presses, allowing for a total of eight presses for each color every time Wario charges them. 1.1 Episode 9: More Shocking Than the Next Episode? Episode 9: More Shocking Than the Next Episode? After defeating Stuffy the 64th in Blowhole Castle, the girl from the previous two episodes finally introduces herself as Tiaramisu. However, she also says that she can no longer continue with her current power, then vanishes. Wario progresses through the last few rooms of the castle, finding the Dragon Mastery Gem in the process. Once Wario exits the castle, he is confronted by Count Cannoli. Wario demands to know where the remaining Wishstone pieces are, but Cannoli summons the Mad Hat Mk. III and commences his third and final battle with Wario. Wario wins, and once again demands the location of the Wishstone pieces, but Cannoli tricks him and escapes into the lab, with Wario angrily giving chase. Upon entering the lab, Wario and Goodstyle find four power generators, which power the devices in the lab and can be charged using Sparky Wario. After exploring the lab for a short while, Wario obtains his first new form since Episode 4, Wicked Wario, allowing him to fly, but only straight up. Later on, Wario gets the Wicked Mastery Gem, letting him fly sideways as well as upward. Eventually, Wario finds himself blocked by a gray wall that seems to have been built in a hurry, but Wario gets past it by blowing it up with dynamite. After breaking through the wall, Wario comes face-to-face with Cannoli and his previously unseen ally, along with the fourth Wishstone piece. Cannoli's ally, who reveals himself to be Carpaccio, calls off the alliance due to Cannoli's failures, then reveals that he had been watching Wario since their first encounter at Sneezemore Cave and knows him much better now. Knowing he can't beat Wario in a battle of strength, he challenges him to a race. Carpaccio says he will hand over his Wishstone piece if Wario wins, but if Carpaccio wins, he gets all of Wario's pieces. Despite Carpaccio rigging the race in his favor, Wario wins, and Goodstyle reads the writing on the newly-acquired Wishstone tablet. The text on the Wishstone piece was: All...all of...shstones...sought... All pieces are collected... the wish...to... That is when...all of... wish...may be granted. Though the text seemed to indicate that whoever reassembled the Wishstone would have their wish granted, Goodstyle noted that some important details of the story were missing. Note: A Treasure Pest will appear in place of one of the red chests, making it unobtainable on the first run. Dragon Mastery Gem In a room accessed through a hidden passage in the second tall room in the castle area. Shooting Star Chunk $256 Replaces the Dragon Mastery Gem during subsequent runs of the episode. Crazy Delicious Bamboo $30 Same room as the Dragon Mastery Gem/Shooting Star Chunk. Wicked Guise Gem In the dark room below where Cosmic Wario must be used to open a switch, accessed by dropping down with Dragon Wario. Small Handheld Toilet $380 Replaces the Wicked Guise Gem during subsequent runs of the episode. Laboratory Map Same room as the Wicked Guise Gem/Small Handheld Toilet. Handy Scrub Brush $809 In the room accessed through a hidden passage on the top-left of the elevator room on the left side of the lab. Voltage-Proof Coil In the room with the numbered switches, accessed by pressing them in order with Arty Wario's blocks. Vita Mighty On a ledge on the right side of the room below where the Voltage-Proof Coil is. Spangly Celebrity Garb $3,191 Replaces the Vita Mighty during subsequent runs of the episode. Itchy Top Hat $349 In the bottom-right corner of the room with water in it. Wicked Mastery Gem Hidden behind a destructible wall in the room with the invisible laser sensors on the right side of the lab, accessed by hitting the rightmost switch in the room directly above it. Ugly Pricey Furniture $49,800 Replaces the Wicked Mastery Gem during subsequent runs of the episode. Amazing Garlic Clove $1,203 In the room to the right of the large room with spiked moving platforms in the top-left section of the lab. Dynamite In the lab's uppermost room. This is the only time that a Guise Gem and its corresponding Mastery Gem are obtained in the same level. This is the only level to have two Mastery Gems in it. This is the only level to have a boss fight in the middle of an episode. Episode 9 has more green treasure chests than any other, with a total of four.